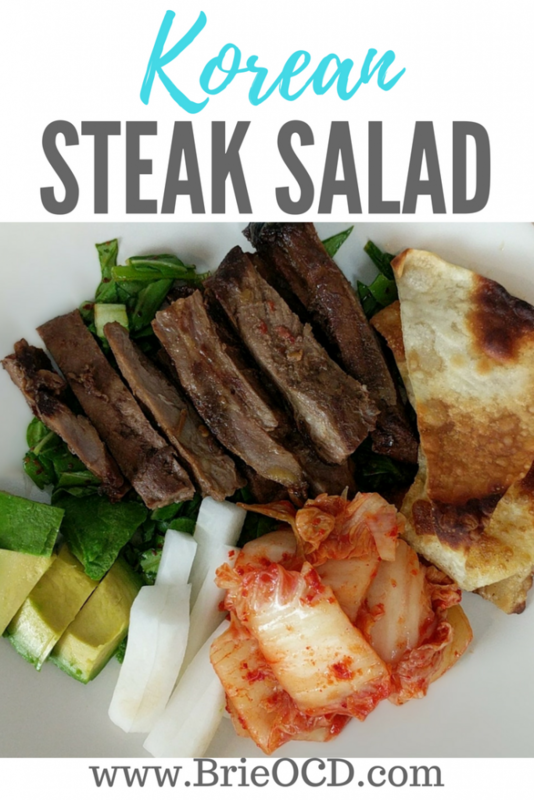 This Korean Skirt Steak Salad is full of bold flavors and best of all spice! My husband loved this recipe by Cooking Light (click here to view). 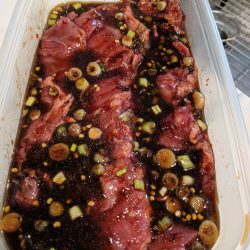 The only thing I changed up on this recipe was instead of throwing the skirt steak into a plastic bag to marinate, I put it in a Tupperware container. 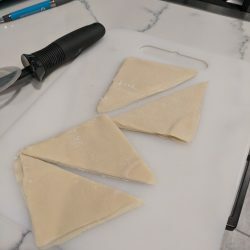 I didn’t know if the ziploc would leak in my fridge and I didn’t want to risk it! 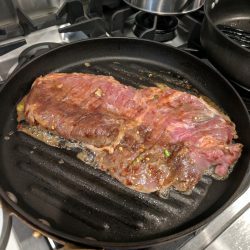 I followed the rest of this recipe to a T because I am not a Korean expert and I didn’t want to mess anything up! Ok, so I don’t usually cook with a lot of these ingredients. That being said, don’t be scurred!! What’s the worst that could happen, you ruin a meal? It’s always worth a shot to step out of your comfort zone and at least try. 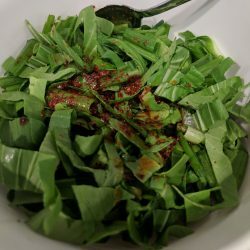 I went to my local Asian-American market called 99 Ranch and found the baby bok choy, daikon radish, chili garlic sauce, wonton wrappers and kimchi! I buy the toasted sesame oil, soy sauce, rice vinegar at Trader Joe’s because they have really great prices on those products. The Gochugaru spice I surprisingly found at Von’s my local market. I was shocked! 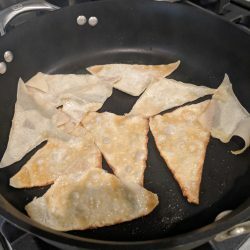 To make this recipe gluten-free simply eliminate the won-ton crisps and use Gluten-Free Soy Sauce or Tamari. 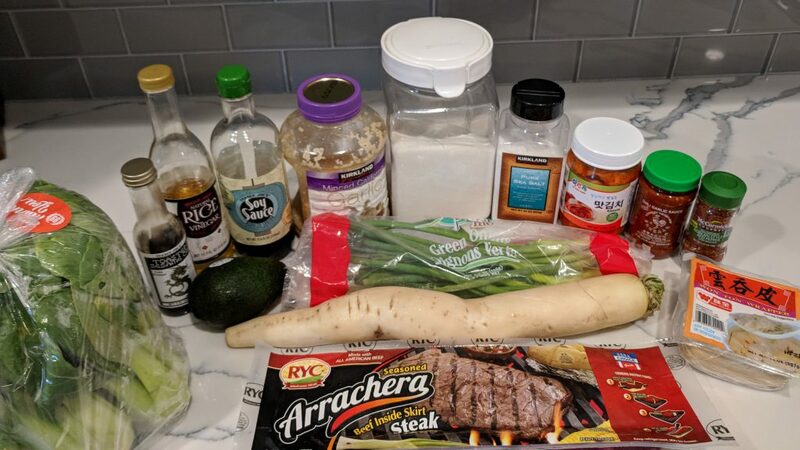 If you are vegetarian you can eliminate the skirt steak and just add more of the veggies. 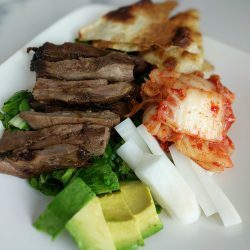 Hope you enjoy this bold and spicy Korean inspired dish! divide all components evenly onto 4 plates and Enjoy!